New trends pop up in the little girls fashion all the time. One of the recent trends in this ever-evolving industry is floral girls dresses and outfits. Although designers favoured floral print and flower embellishments for years; this year they presented floral girls dresses reimagining the ways of using floral decor. The trend is making an appearance in many new special ways. The newest trend in floral girls dresses is the use of 3D flowers. Floral appliqués are attached to girls dresses and outfits to intricate accessories and patterns. Papilio Kids designers used 3D floral embellishments together with beaded elements, lace accents, and embroidered details to create truly unique little girls dresses for special occasions. 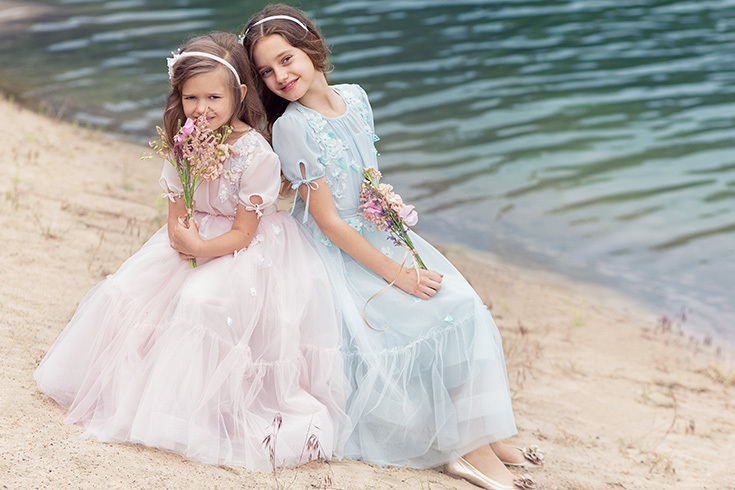 Ceremony Collection features beautiful floral appliqués to give a natural feel to flower girls dresses. This kind of floral girls dresses will be ideal for any style wedding. Floral prints come in a variety of styles, shapes, colors, and designs. If your little girl has a favorite flower, consider looking for floral girls dresses with her flower. Remember to check a size of the print when choosing a dress for your little girl. Younger or smaller girls should try to avoid larger prints as they might overwhelm a petite frame. Another way to incorporate florals into little girls dresses for special occasions is through the use of embroidery. Beaded embroidery adds a touch of sparkle while thread embroidery adds a classic detail. The floral beaded embroidery over a girl’s dress will create an exquisite look. Many people overlook the fact that lace is floral in nature. Simple cotton laces add a touch of sweetness to a casual girl’s dress, while beaded lace fabrics are perfect for little girls dresses for a special day. The most recent trend is using a crochet-like flower lace. Flower girl wearing the dress made of this type of lace will have a distinctive, stylish look. Most importantly when it comes to dressing up your little girls, make sure they love what they are wearing!